Wordful Wednesday – Oh, the Rain! Sky streams soak the sponge-like land. 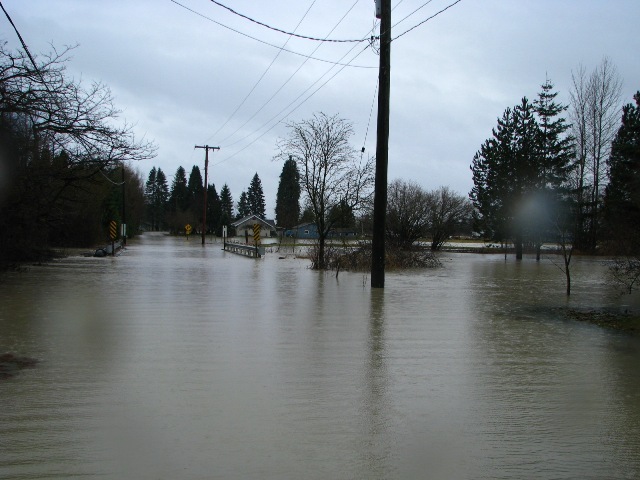 The river has topped its banks. The rain falls, snow melts. Bad for drivers, good for sleds. 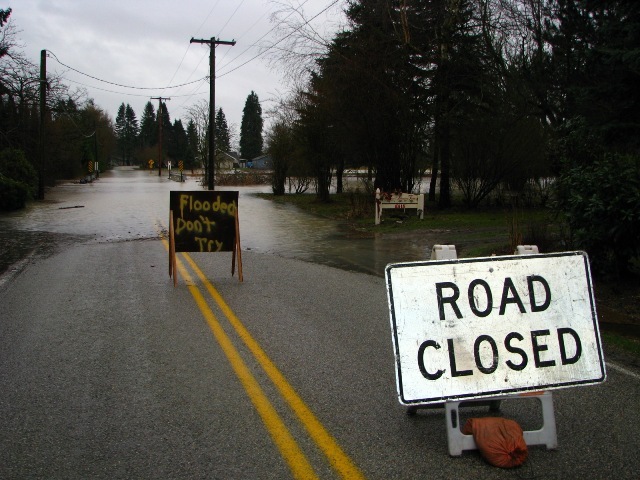 Now, too much rain and flooding. 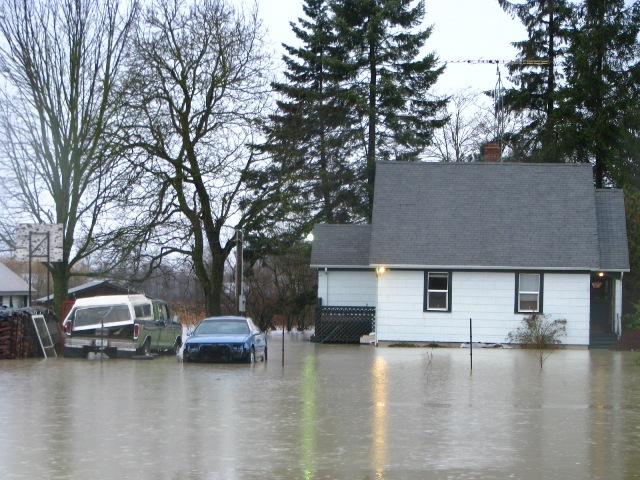 This is our neighbor’s house at the corner of Alm Road and Gillies Road. 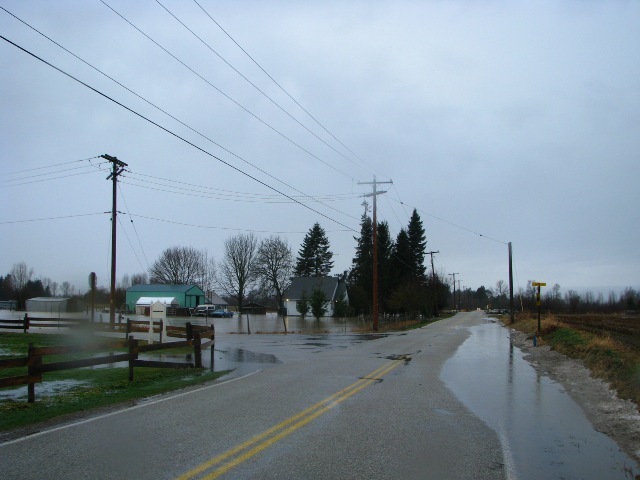 At the bottom of our road, looking south. 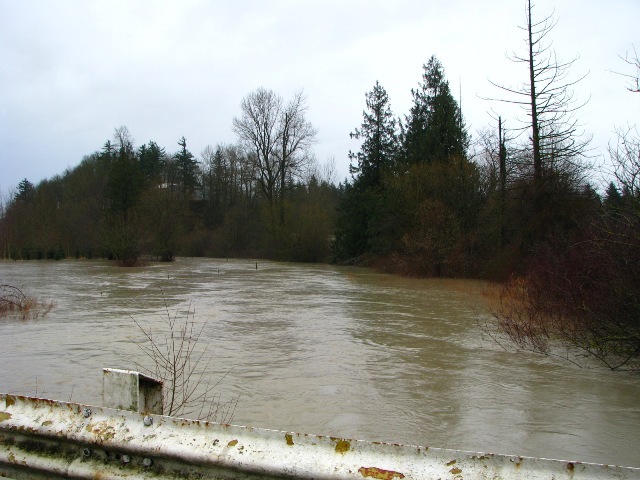 This shot is of the Sumas River (near Alm and Gillies Roads) which is really nothing more than a creek most of the time. Guess who got stuck while taking these photos? My husband, the intrepid adventurer, and his noble sidekick with a camera, our daughter Laura! Never fear! 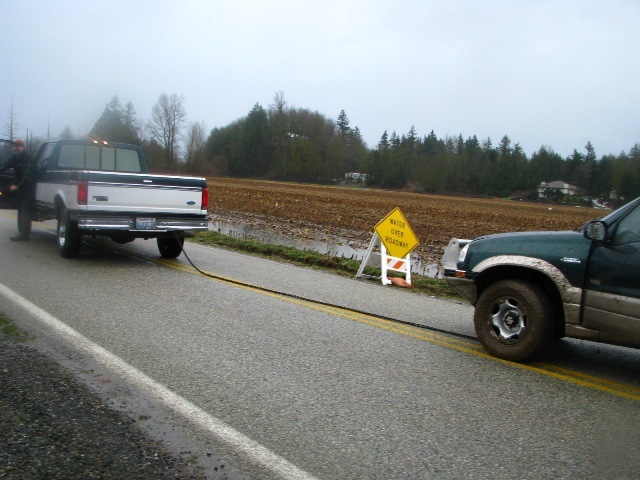 Our kind neighbor took a break from bailing out his flooding basement to rescue Rick and Laura from the muck. 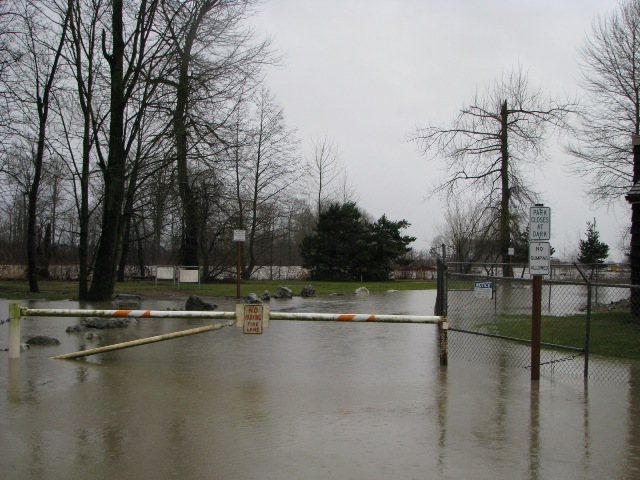 Flooded Riverside Park near the Nooksack River. 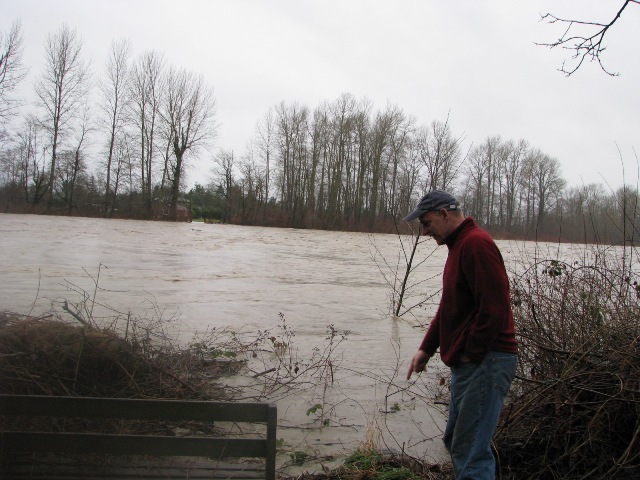 Here is Rick by the flooded Nooksack River, pointing out to Laura that the water is still rising. These photos were taken at about 3:30pm today. Outside my Window…I see dove-gray skies, lots of rain and melting snow! Though I love the beauty of snow I am definitely excited that we can use our van again, and I can take the Suzuki out of 4-wheel drive (better gas mileage). Just this Sunday friends had trouble with the packed snow on our road, and the deep snow on our driveway. 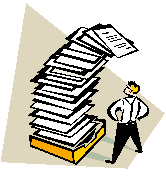 I am thinking…that I still have lots of paperwork to get done this week. I spent maybe four hours working on some paperwork for my elderly mom so she can continue to receive her widow’s pension from the Veteran’s Administration. On the form it states that the ‘time burden’ to fill out the form is about 30 minutes BUT much detailed information was required and lots of writing. I don’t know how an elderly person would be able to do this on his or her own. From the learning rooms…I am hoping to attend a Love and Logic seminar, ‘Success With Underachieving Kids’, which is going to be offered relatively near here in March. I’m waiting to find out if one of my friends at the middle school will be able to make the drive with me. I am so excited! I am thankful for…another day to be alive, and all of the Lord’s gracious provisions. Right now I’m enjoying a great cup of coffee before leaving to work for four hours at the middle school. From the kitchen…Yesterday we had left-over beef stew, due to busy schedules on all of our parts. Today I need to make some more bread. I’m also hankering to make some cornbread stuffing with white sauce, since I haven’t made that in a while. It’s a warming, comforting meal on a cool, drizzly day. Of course I’ll serve a green salad or veggie with that. I am wearing…white blouse, denim skirt, leggings, and a cozy sweater. What’s new? I am reading…or rather still reading, Love & Logic Solutions for Kids With Special Needs, by David Funk. I just read a wee bit at a time, and try to put the concepts into action so that I will really benefit the students with whom I work. I am hoping…to go for a walk today. I’ve been much less active while it’s been so snowy and icy outside, due to the fear of twisting my ankles, which I am prone to do. I am creating…a less cluttered home, little bit by little bit, with help from my dear family. I am hearing…the hum of my husband’s computer. The grandchildren are still sleeping (hope my daughter got some sleep last night, too), so it is QUIET right now in our house. Around the house…we have melting snow, people! 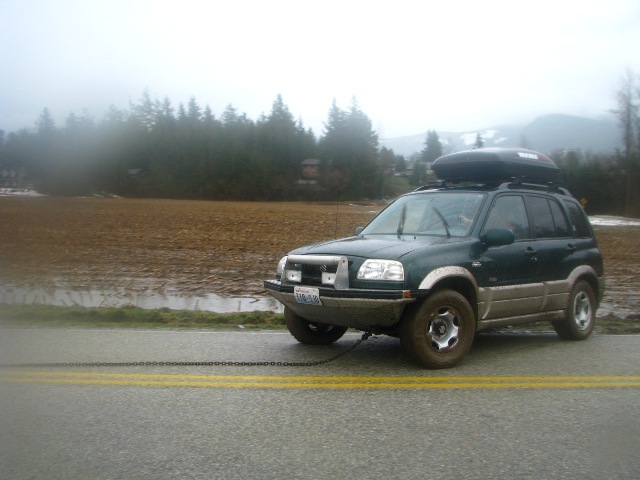 I may ask for a load of gravel for my birthday so that the deep ruts in our driveway (from spinning tires!) can be repaired. I do enjoy a smooth driveway. One of my favorite things…is the beginning of each new day, so full of the hope of getting things done, and not yet full of the pressure of getting a few more things done. A Few Plans For The Rest Of The Week…I need to fill out some paperwork for our accountant, which is a chore that seems difficult to me, and which I have been putting off for a couple weeks already. Sigh! 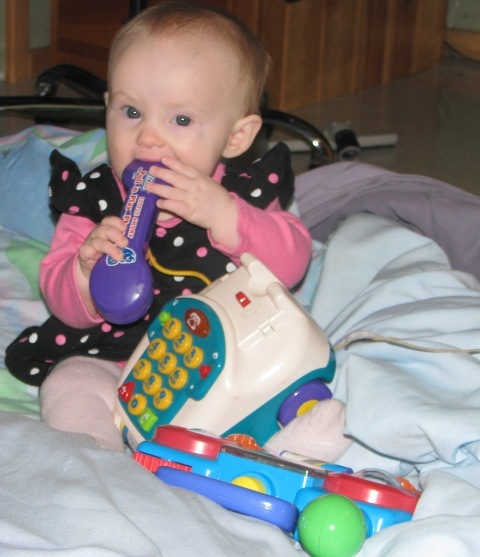 Granddaughter Carly demonstrates how to properly use the telephone. Her momma took the picture.